Our first steps into Camp Edwards were exhilarating; from the snow under our shoes to the warm welcome we received from the camp counselors. After a 2 hour flight to O’hare International airport and a quick drive from Chicago, we couldn’t wait to get our adventure underway! During the first night in Wisconsin, all 120 participants met in Micklewright Lodge to mingle and be placed in groups. Each group was led by a camp counselor and would meet for discussions after listening to guest speakers throughout the week. The counselors, who were all volunteers, embodied the meaning of selfless service by giving their time to facilitate leadership abilities in today’s youth. Many made memorable impressions on the campers, such as Marv, who rapped his introduction, or Grizz, whose outlandish woodland stories were sure to entertain. Junior Advisory Board member Emily reflects on her interactions with the counselors: “They were so welcoming and energetic. Every single counselor I came across was fun to be around.” As the night drew to a close, everyone began to return to their cabins. Of the 8 Joshua’s Heart members attending RYLA, 7 of us stayed in an all-female lodge called Runge. Chaz, the only boy, stayed in a cabin. March 8th marked the first official day of RYLA activities. Our morning began with a family-style breakfast before heading back to Runge lodge to hear from speaker Rick Metzger. He conveyed a message of finding humor in everyday life, committing random acts of kindness, and being willing to give and receive help through colorful anecdotes of his wrestling career, as well as an assortment of visual aids ranging from roses to fake IDs. He spoke to us several times over the course of the day. Metzger’s second discussion was centered around understanding different personality types. By learning about different types of people, a leader can enhance their team’s productivity and cohesiveness. Eventually, the sunset on the horizon and we made the transition from work to play. Everyone gathered around the fireplace in Micklewright for a night of singing, magic tricks, bonding, and smores. We expected an outdoor campfire considering the name of the ceremony was Campfire, but the fire in the Micklewright lodge led to just as much fun. After a full day of leadership immersion and workshops, our time in Wisconsin promised to be as engaging as it was enjoyable. Day 3 at Camp Edwards meant a packed schedule of presentations and preparation. 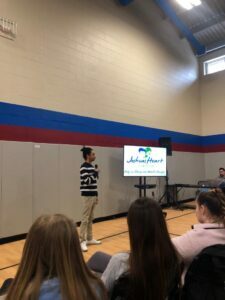 On the morning of March 9th, Joshua Williams spoke to the RYLA students about his journey in creating his foundation. Executive board members Thalia and Emily also told the group about their involvement in Joshua’s Heart Foundation from planning distributions to coordinating with other volunteers. To contextualize the impact of Joshua’s Heart, not only on the recipients of the food but also on the volunteers, Anielya and I described our school supplies project. We wanted to showcase how being a member of Joshua’s Heart inspires everyone involved to make their mark in different ways. Besides Joshua, there were two other influential speakers that day: Tom Carrol and Chris Norton. Mr. Carrol gave everyone hope that they can become successful with any path they take as long as they follow their passion and work where their talent lies. He used his own story as an example: Carrol graduated from college with a degree in psychology but built his career in the business sector as a human resource manager, the company CEO. Next up was Chris Norton, a former football player who became paralyzed during a game. Despite his limitations, he relied on his determination to walk again at his wedding and college graduation. Norton’s life is a poignant example of everyone’s ability to fight against insurmountable obstacles. Joshua’s Heart member Anielya learned the following from his experiences, “No matter how many times I get knocked down or fail, I can always get back up and defy the odds. 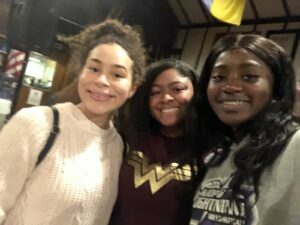 Norton opened my eyes and made me think I couldn’t take things for granted.” After soaking up those valuable lessons, we rounded off the day performing group skits. Each of the groups created their own unique performance based on things they experienced while at Camp Edwards. Some mimicked Grizz’s stories, some made talent shows, and others demonstrated camp games. Everyone had a great time during the creative commemoration of the past few days. 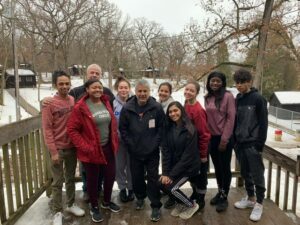 On the final morning of the Rotary Youth Leadership Awards, we all prepared to say goodbye to Camp Edwards, our newfound friends, and the Wisconsin snow. “I had a lot of fun in the snow,” says JAB member Virginia, “I got to go sledding for the first time, we threw snowballs at each other, and we were able to take beautiful pictures in the snow as well.” Photos are an easy way to freeze a moment in time, but to capture the friendships we made, all the RYLA students signed each other’s T-shirts. The shirt serves a reminder of the important lessons learned and is a memento of our 4 days of leadership growth in Wisconsin. Shortly after the signing, the Junior Advisory Board was flying home to Florida with plenty of memories to share. Acceptance of any contribution, gift or grant is at the discretion of the Joshua's Heart Foundation. The Joshua's Heart Foundation will not accept any gift unless it can be used or expended consistently with the purpose and mission of the Joshua's Heart Foundation. The Joshua's Heart Foundation will refrain from providing advice about the tax or other treatment of gifts and will encourage donors to seek guidance from their own professional advisers to assist them in the process of making their donation. The Joshua's Heart Foundation will accept donations of cash or publicly traded securities. Gifts of in-kind services will be accepted at the discretion of the Joshua's Heart Foundation. Certain other gifts, real property, personal property, in-kind gifts, non-liquid securities, and contributions whose sources are not transparent or whose use is restricted in some manner, must be reviewed prior to acceptance due to the special obligations raised or liabilities they may pose for Joshua's Heart Foundation. The Joshua's Heart Foundation will provide acknowledgments to donors meeting tax requirements for property received by the charity as a gift. However, except for gifts of cash and publicly traded securities, no value shall be ascribed to any receipt or other form of substantiation of a gift received by Joshua's Heart Foundation. The Joshua's Heart Foundation will respect the intent of the donor relating to gifts for restricted purposes and those relating to the desire to remain anonymous. With respect to anonymous gifts, the Joshua's Heart Foundation will restrict information about the donor to only those staff members with a need to know. The Joshua's Heart Foundation will not compensate, whether through commissions, finders' fees, or other means, any third party for directing a gift or a donor to the Joshua's Heart Foundation. Assist at the warehouse to sort, pack and distribute groceries. Clean up and organize the warehouse. Call 305-788-8295 for more information. Please note if you’re younger than 14yrs old, you must be accompanied by an adult. Volunteer forms must be completed prior to assisting. Help us stomp out hunger & poverty.